It is doubtful when he wrote a letter to a medical journal about patients in Mumbai afflicted with an untreatable form of tuberculosis that Dr Zarir Udwadia was seeking to become the source of the controversy himself. But instead of provoking an all-out attack on the disease, as he had hoped, the letter set off a global health alarm and, at least initially, prompted a backlash from the government. Until writing the letter in late 2011, Udwadia was perhaps best known as the pulmonologist to the elite in Mumbai, where his physician father had become known nationally for saving the life of a Bollywood superstar, Amitabh Bachchan. Hardly anyone outside public health circles knew of the free weekly TB clinic the younger Udwadia had run for more than two decades. Udwadia wrote about four of his clinic patients for whom none of the commonly used medicines worked to combat the disease, a deadly bacterial infection that can be transmitted through a sneeze or a cough. The idea that people could contract such a deadly disease sitting next to someone on a bus or on an international flight aroused concern among global health authorities and created a problem for the Indian government. TB is so old that it has been discovered in the skeletons of Egyptian mummies, was recorded by Hippocrates and is mentioned in the “Rig Veda”, a collection of ancient Sanskrit texts. The disease disproportionately affects the poor because it spreads easily in crowded places among people whose resistance is low from malnutrition or illness. It has been curable for decades with a regimen of several antibiotics taken for six months. But often patients fail to follow the whole course of treatment, and the disease mutates into a more virulent form. India is of particular concern, having the most TB patients in the world — more than 2 million of the more than 9 million active cases globally. India also has the most drug-resistant patients, about 100,000 with multi-drug resistance in which the two most powerful TB medicines do not work. Mumbai is especially problematic because of its overcrowded slums, with almost a third of TB patients in some neighbourhoods having a resistant form of the disease. Drug-resistant disease is more expensive and even more difficult to defeat than the traditional form, requiring two years treatment with such a toxic course of medicines that many patients drop out. Even if they do complete the regimen, studies show there is only a 60 per cent likelihood of a cure. In the media storm that followed Udwadia’s journal letter, government officials publicly denied the problem and accused him of wrongly setting off a panic. A Mumbai health official seized his patient samples for retesting. Udwadia clammed up for a few weeks but then re-emerged even more outspoken than before, vigorously defending his findings and denouncing the government for its complacency. The 55-year-old physician has been extremely vocal ever since, criticising the government for failing to take advantage of a new generation of medicines to stamp out the disease. “With the new TB drugs approved by the FDA, nobody should be dying of TB,” he said in an interview in his small office where, during his free clinic, he stood by an open window, examining the leather tanners, taxi drivers and maids, in saris, burqas and turbans, who were waiting in the long corridor outside. Just a few weeks ago, Rahima Shaikh, 44, one of the four drug-resistant patients he described in his 2011 letter, lay on the table by the window as he listened to her chest and reviewed her test results. Where many international and Indian public health experts are cowed into speaking in diplomatic jargon for fear of losing government support for their programmes, or even their jobs, Udwadia stands out as the most influential voice demanding better treatment for India’s TB patients and unabashedly criticising the status quo. 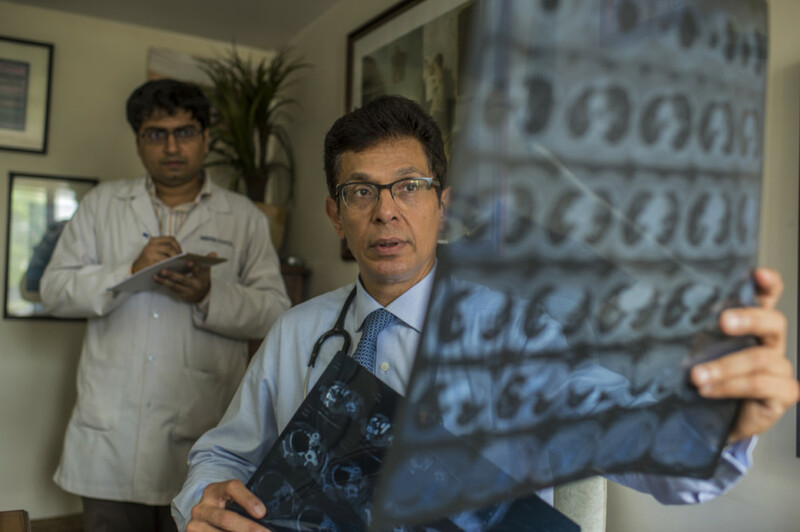 Udwadia grew up in Mumbai, training in government hospitals, where TB was widespread, and at City Hospital in Edinburgh, where researchers first combined medicines for a cure. After its initial criticism of Udwadia, the Indian government did an about-face and announced increased funding for the country’s TB programmes, with a special focus on drug resistance. And the city of Mumbai began seeking out patients with drug resistance and treating them. Udwadia notes that the government TB programmes still do not identify or treat the majority of drug-resistant patients. Two new TB drugs approved in Europe and the United States several years ago are still not available in India, he says. Udwadia began using the first of the new TB drugs with his sickest patients soon after it was approved by the US Food and Drug Administration in 2012. It is still not approved for widespread marketing in India, though the government TB programme has promised to make it available to 600 patients with multidrug-resistant TB next month. Fifteen of his 20 patients who received the new TB drug recovered, which is significant, Udwadia says, because they were his sickest, having failed to respond to almost every other treatment. Where he was not widely known internationally before the controversy erupted over his journal letter, Udwadia is now a sought-after speaker abroad. He communicates regularly with the physician who had been his hero for decades — Dr Paul Farmer, whose work was chronicled in the book “Mountains Beyond Mountains: The Quest of Dr Paul Farmer, a Man Who Would Cure the World”, by Tracy Kidder. This year, Udwadia addressed immunology students at Harvard University. Next month, he is scheduled to speak at the Bill & Melinda Gates Foundation’s Grand Challenges in Global Health meeting in London. When Shaikh, a tiny woman wearing a salwar kameez, showed up for her recent checkup, Udwadia grinned and reached across the table to shake her hand, unable to contain his excitement as he reviewed her tests. They were negative for TB for the third successive year.